Trending at $6.95Trending price is based on prices over last 90 days. ATARI 2600~CALIFORNIA GAMES*RARE~GOOD CONDITION*WORKS/PLAYS GREAT~TAKE A LOOK!!! 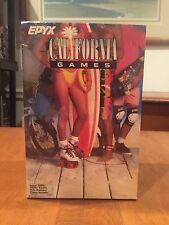 California Games - ( Atari 2600 ) Complete W/box & Manual ! This page was last updated: 20-Apr 20:08. Number of bids and bid amounts may be slightly out of date. See each listing for international shipping options and costs.